We offer Centering Plate to our clients. We are one of the leading manufacturer and supplier of Shuttering Plate. Aimed at prospering growth in our domain, we develop and supply an exceptional and comprehensive collection of MS Imperforated Folding Shutter. Known in the industry for their tough built, high strength and seamless finish standards, these offered shutters are installed as lift doors to prevent and allow people from entering. 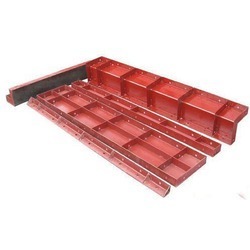 We are a renowned Manufacturer and Supplier of Scaffolding Shuttering Plates. These Scaffolding Shuttering Plates are made of premium quality steel and other alloys that ensure sturdiness and high compressive strength. Further, Scaffolding Shuttering Plates are precisely designed, ensuring dimension accuracy.